The Urbane Mitte feels like home at the point where north meets south and east meets west. There are links in all directions. Thanks to the Gleisdreieck interchange station, to which the S21 S-Bahn line will be added in future, the Urbane Mitte is not only easily accessible. Other Berlin destinations are also just a short distance away from here. The western and eastern centres of Berlin are just a few U-Bahn stations away, Potsdamer Platz is within walking distance and just a short cycle ride separates the Urbane Mitte from the government district. 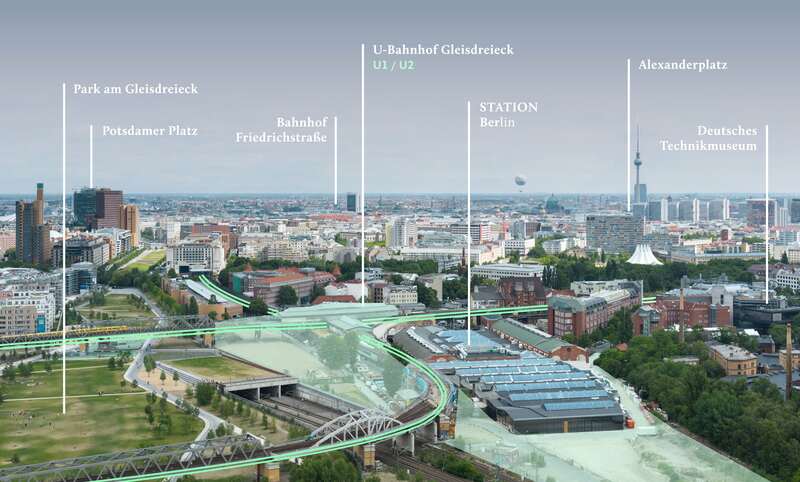 The S-Bahn will connect the location with Berlin’s Central and Südkreuz train stations. Tegel and Schönefeld airports are easily accessible without having to change trains too often.